I call this fragrance for the good life! The scent is hay. It is important that the animals get a good hay of a good quality, because then we also get good, healthy food ... Hay is something we take care of and save carefully, and so we have done all the time. Before it gets hay we will protect the places where it grows. Nutritional places with lush greenery are a necessary and important part of the earth's cycle. Most of us has also memories of hay, maybe from our childhood or from feeding our animals? 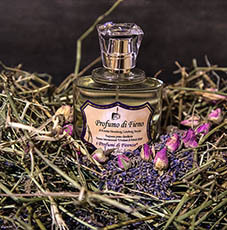 I have had the fantastic opportunity to create a perfume with my own interpretation how a fresh hay should smell. I'm not the first to have done it, but we're not so many. This is a niche perfume!